How will the development of artificial intelligence affect my job? A.I machines make various tasks faster and simpler, leading to fears that machines could do our jobs better and produce results in a more efficient manner. Artificial intelligence (AI) encompasses different technologies which are combined in many ways to sense, understand, act and learn in order to produce an intelligent result. 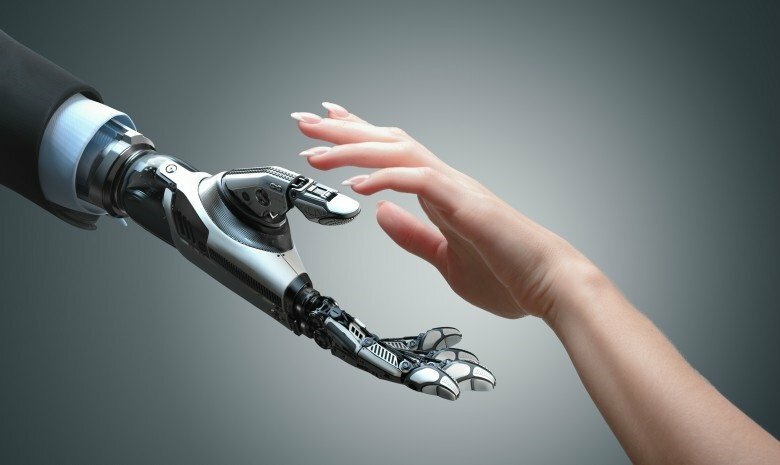 This new and exciting era of technological development aims to create A.I machines that make various tasks faster and simpler, leading to fears that machines could do our jobs better and produce results in a more efficient manner. 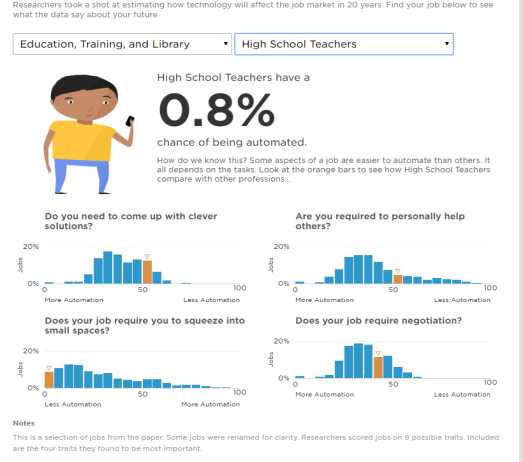 Do you think a robot could do your job? See Could you really lose your job to a robot? Some emerging AI technologies include computer vision, audio processing, natural-language processing, machine learning and expert systems. It appears that call centres and support teams may be the first to be most affected by artificial intelligence. Virtual agents, for example online chatbots, could take the place of call-centre agents and sales-support personnel. Salesforce first launched an SMS chatbot product in 2014, and has since expanded it to include Facebook Messenger. The company also offers a product called Live Agent Chat, which facilitates human-to-human interactions. "Salesforce believes fundamentally that bots are going to be complementing your live staff," said Meredith Flynn-Ripley, vice president of mobile messaging at Salesforce. "We really see bots as changing the job description and turning agents into intelligent problem solvers." While the majority of customer service interactions are still over the phone, Flynn-Ripley said that call centers could soon undergo big changes as more companies embrace chat as the most natural way to interact. "We often see the voice calls go down in a matter of weeks, and customer satisfaction go up," Flynn-Ripley said of new customers. "There's now an expectation that there should be automated bots." Cognitive robotics are robots that can learn from experiences, the environment, and on their own. Examples of this are machine vision, voice recognition and proximity sensing. Ultimately, the robot must be able to act in the real world. Packaging and paper company Mondi has not only been using robots on the shop floor for years; it has taken things a step further with AI, allowing robots to learn continuously. Jacqueline Wild, global head of applications for Mondi’s Consumer Packaging Business Unit, explained that they collect data on the shop floor system, bringing it back to a machine that then learns from it and improves the product at the end of the day. Ultimately, the goal is “taking the robot out of people” so that people get a chance to do more strategic work, talk to each other, and innovate for better products for their customer. One of Mondi’s strategic goals is for their customers to have good experiences. If employees are continuously busy with repetitive tasks such as entering data, they can’t think about what the customer experience could be, or how the product should be developed to get a better customer experience. Mondi aims to eliminate the repetitive month-end tasks within an estimated two to three years. Speech analytics refers to software that recognises speech patterns to identify emotions and stress to improve communication, guide interactions and extract information. In short, the process of analysing recorded calls to gather customer information in order to improve communication and future interaction. The process is mostly used by customer contact centers to extract information buried in client interactions within a company. Recommendation systems are aimed at social media marketing and content targeting. It is essentially an information filtrating system which strives to predict the "rating" or "preference" that a user would give to an item. Recommender systems have become increasingly popular in recent years, and are utilised in a variety of areas including movies, music, news, books, research articles, search queries, social tags, and products in general. There are also recommender systems for experts, collaborators, jokes, restaurants, garments, financial services, life insurance, romantic partners (online dating), and Twitter pages. Amazon is a brilliant example of a recommendation system. Laura Africa serves as Customer Service Liaison and Writer at Careers24. She started her career as a journalist, and shifted into customer service after discovering her passion is to assist people and deliver sterling service. In her downtime, Laura enjoys spending time outdoors with her family.